How these ingredients balance and work in unison is what determines a shell’s effectiveness. Let’s start by looking at the primer. It may well be one of the smallest components involved but it plays one of the largest parts in putting a payload of pellets into action. Different primers burn with a different “hotness” and the skill of every loader is to marry the right primer to the right powder. If it’s wrong, the cartridge might go off like a damp squib or kick like a mule. Speaking generally, a hot primer with fast ignition will be used in light, high performance clayshooting loads whereas a slower burning powder and primer will be favoured for heavier game and wildfowling loads. A skilful loader will use the right combination of primers and powders so that there is excellent control of the way in which different cartridges come up to speed within safe pressure limits. Shot, wad and powder are held in place by either a rolled turnover (RTO) or a crimp closure. The RTO is an old-fashioned method but still used for shorter chambered guns such as the 2in and in the smaller bores to get a heavier load in the cartridge. So what about crimp closure? What is it? Usually today you will see a six star crimp. You might see a rarer eight star crimp sometimes, which is still used for higher performance competition shells. Crimp closure is popular nowadays as it tends to give better patterns than a RTO. It also manages the pressure and velocity of the cartridge and is also intrinsic on managing the pressure and velocity of the cartridge. The propellant used in a cartridge dictates its performance and most find it the hardest part of a cartridge’s make up to understand. Different powders are purposely designed to generate speeds and pressures specific to the quarry being pursued, and for use in guns proofed to fire them safely. Back in the day, black powder was the only propellant on offer. Guns then had longer barrels than they do today because the extra length gave the powder time to burn completely and develop sufficient pressure to send the pellets speeding on their way. Modern nitro powders behave very differently in that they burn more quickly and efficiently therefore making it easier to tailor a cartridge to different ballistic requirements, and a shooter’s specific needs. A fast burning propellant might reach full speed and performance inside the barrel within 12in of the standing breech whereas a slower powder may take up to 18in of barrel length to do the same, yet both shot charges will leave the barrel at the same speed. High performance, fast burning powders for light loads tend to be what’s called ‘single based’ with nitrocellulose as the single main constituent making them more hygroscopic and, hence, more susceptible than ‘double base’ propellants to damp and cold conditions. To counteract this, single-based powders contain stabilisers such as diphenylamine. Slower burning double base powders tend to be used in heavier loads and have nitrocellulose and nitro glycerine as their two main constituents. They also contain oxidisers to sustain combustion. Well, cut a cartridge open and generally a single base powder is flaked with a larger surface area to ensure the burn is faster. Double base powders are more likely to be granular, with a smaller surface area. Another part of the cartridge is the wad, which is made from plastic or fibre. There are many different varieties of plastic wads with the full cup version being most common. Thicker wads made from more robust material are needed to protect a gun’s barrels when using shot such as steel or tungsten. Variants include dispersant wads, for maximising the spread of the pattern and Bior wads, which are partial cups designed to deliver the best pattern distribution for a chosen discipline or quarry. Fibre wads are sometimes referred to as felt. They are made from biodegradeable materials and now predominate in game loads. Plastic wads tend to have “petals”. These expand to create a seal within the bore of the barrel whereas fibre wads have to be compressed when they are placed in the case. This compression ensures that when the wad enters the barrel it expands to make the same seal. 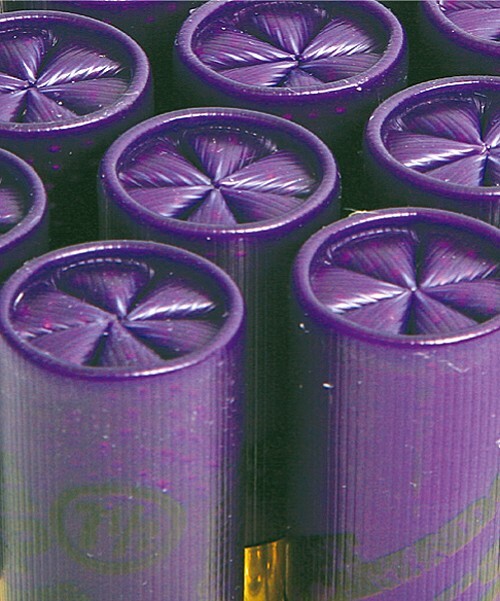 Fibre wad cartridges often produce a little more felt recoil because they are loaded at a slightly higher pressure. Lastly, let’s talk about the shot load in a cartridge. 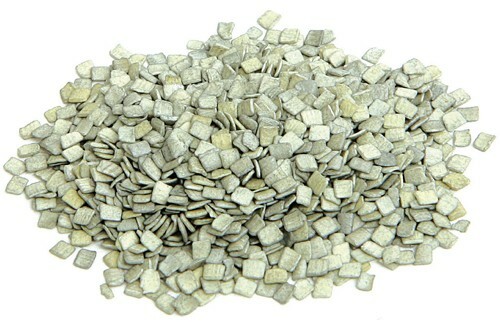 This is usually manufactured from lead, however shot contains other elements and the most important is antimony. Antimony hardens the shot and most high performance clay shells contain up to 5% to ensure clean breaks. Lead shot (above) and Gamebore’s patented Diamond Shot (right). Game cartridges on the other hand carry softer shot that deforms more readily, thereby offloading energy on the quarry to bring about humane kills. Antimony in game shot is usually in the order of 2 or 3%. 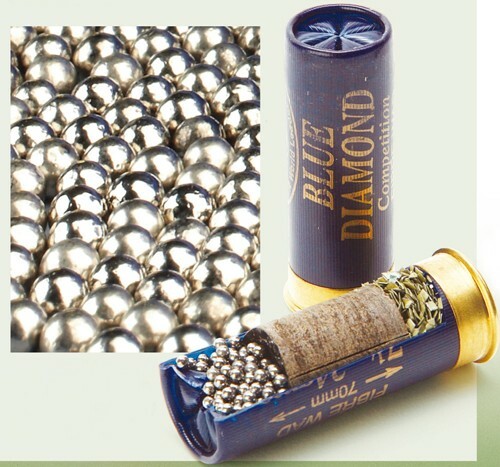 Occasionally cartridges are loaded with pellets coated in nickel or copper. Nickel creates even harder shot. However in both cases the coatings prevent pellets sticking together (balling) on firing. As a result they give better and more even patterns. The downside is that these coatings make the cost rise. 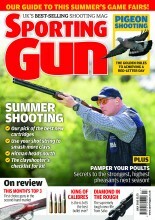 The weight of a shot load is always printed on the cartridge in grammes. 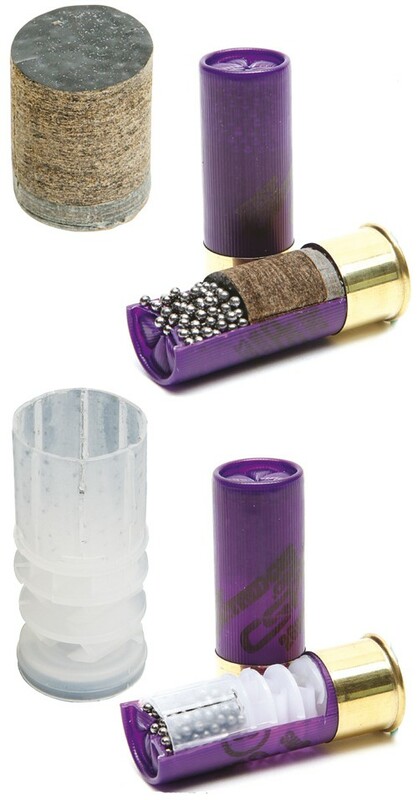 The heavier the load, the more pellets the cartridge carries. However, a heavier load does not mean that you have a larger chance of hitting the target! A faster burning powder is likely to be used for this light 24gm load of 7.1/2 shot (above) whereas something much slower will sit underneath the 36gm 4s (right). Heavier loads do not offer more power either. In fact, heavy game loads tend to use slower burning double base powders which generate a lower muzzle and down range velocity. This should not be seen as a disadvantage. If a 36gm (1.1/4oz) fibre wad high bird shell had the same velocity as a 28gm plastic wad competition cartridge, we would soon suffer from exceptionally heavy recoil. The ‘power’ of a cartridge relates to velocity but for gameshooting in particular it derives from the kinetic energy of the pellet so that a larger pellet size will therefore have more striking energy for a given velocity. Hopefully this guide to how a shotgun cartridge works has proved helpful to you, particularly if you have recently started shooting. If you have any queries, please leave a comment below.